Because many members have trouble with titlescreen editing, I have made a small programm in C#, which helps you with the puzzle. PS: Since I'm a newbie to C# there could be some bugs. WOA THANK YOU THANK YOU THANK YOU!!! I've been looking for this!! Thank You. This will be an easy way to put the logo in the Game. Oh My God, you're Amazing, but probably i won't use it because i've already done my logo, but anyway thanks. EDIT: I mean it appears smaller in-game. A lot smaller or a bit smaller? No matter because it is THE logo editing thing. Dirby should implant this in the editor, if RicBent says yes. I tried this on a Clean ROM. Hm... anyways we won't care of this because the logo looks awesome. It's just resized of 5px. Oh and, RicBent how about show the palette on the editor? Because we can't know how much color we can use, and it can be anoying for coloured logos like New Super Mario World's one. Thanks I made it myself, Haydn didn't make it. I made it myself to save time. Looks awesome but MAYBE (if you want) you can change the color of the " star " where the GRAND is written. About the colors: I don't know how to do that. I'm new to C#, but maybe I'll find something on google. About the size: The logo has at the right side many small areas in the puzzle (About 10). I was too lazy to add these too. 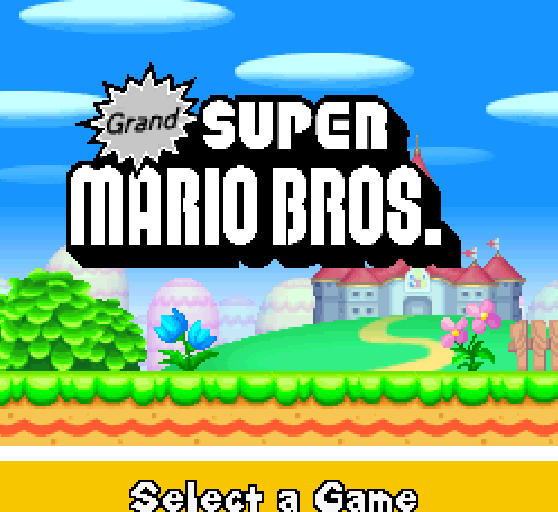 I just re-colored the original NSMB logo in Flash, and removed the "New" and added "Grand" instead in the font "MS PGothic". With custom anti-aliasing with Thickness: 200, Sharpness: 400. Hm yes if you are a newbie, it isn't a problem, if this is implented, Dirby will add the palettes. Are you going to make another version to? Maybe you can make also that you can import a exported png from NSMB DS and export as png. I mean the opposite of what you can do now with that editor, you get? to edit some small things at the original logo. Something else: How did you make that program? Great for a C# Newbie! Cool program! AWESOME WORK! Nice idea I'll try to do so. I love that! Can i put that in my forum?